Marvel at 28 lovely lanterns adorning one of the property's old oaks. THAT ARBOREAL GLOW: Trees and lights have been a beautiful twosome since the dawn of electricity, and, of course, long before electric bulbs were invented (hello, candles). But finding pretty, light-up-the-night branches that go beyond the traditional glow of small string-based bulbs can be a little trickier. 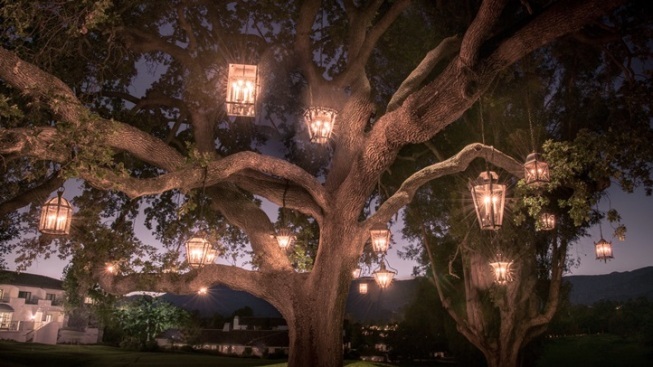 You may come across the occasional larger lantern gracing a tree in a yard, or, if you're at the Ojai Valley Inn & Spa during the fall of 2016, you'll see a number of art-lovely light fixtures complementing the property's best-known oak tree. Those lanterns are the creations of artist Paul Ferrante, and the title of the work holds the mystery and allure of the piece itself: "Illume." AUG. 26, 2016... was the launch date for the lantern-bedecked tree, and while no firm end date is currently on the hotel's schedule, count on the mood-enhancing lights to remain up "through the holidays." They'll be on each night, if you're curious, but Fridays will be something a bit special in the area of the 200-year-old oak: a pop-up lounge, complete with gratis glasses Veuve Clicquot. What will you chat about as you sip? The individual details on each of the 28 lanterns dotting the tree's lengthy branches? How some are hexagons and some are globes and all reflect the Spanish Revival feel of Ojai Valley Inn & Spa, which will celebrate its centennial in just a few years? Or perhaps the enchantment of the moment will call for silent reverie and peaceful enjoyment of the incandescent scene. MAKING A DATE... with the Ojai Valley landmark? Start here, and decide if a Friday night, or any night, is going to be part of your lantern-communing getaway.